Social and political implications of datafication go beyond individual privacy, since data processes are not ‘flat’ and do not implicate everyone in the same way, but, rather, are part of a system of ‘social sorting’, creating new categories of citizens, and premised on an emerging order of ‘have’ and ‘have nots’ between data profilers and data subjects. In such a context, questions of social justice and datafication require detailed study. 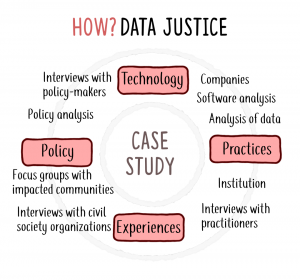 We frame the research agenda around the notion of ‘data justice’. It will provide a European framework of study and take a holistic approach by situating research on data processes in the context of the concrete experiences and practices of particular communities; b) technological analyses of data sources, algorithmic process and data output; c) policy frameworks that relate to the interplay between digital rights and social and economic rights; and d) conceptual engagement with new social stratifications emerging with datafication. Research team: Lina Dencik (PI), Fieke Jansen, Philippa Metcalfe, Javier Sánchez-Monedero and 1 post-doc yet to be announced. Copyright © 2019 DATAJUSTICE project. Powered by WordPress. Theme: Spacious by ThemeGrill.